If you are bored of seeing the same old default yellow colored folders then you can add color and stylish skins to your folders and make them look peculiar and interesting with some wonderful folder colorizing software. And with the installation of the Additional Skin Pack you can add several stylish skins to your folders besides just adding color. 1) After Installing both iColorFolder and Additional Skin Pack, select the skin from the skin selector window. 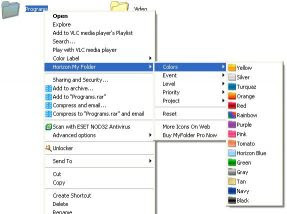 2) Open any drive with folders and highlight the folder you want to color. 3) RIGHTCLICK your mouse and you will see COLOR LABEL option in your menu. Just choose your color from the list of color or press custom to select an icon from the list. To reset and get back to the original icon select none. This is a powerful and easy-to-use colorizing software with lots of useful features. With many eye catching colors and icons available here you can give a unique look to your folders. 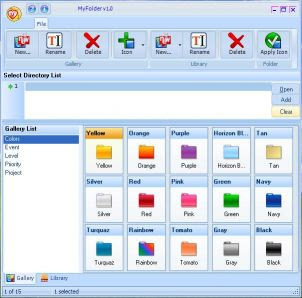 Just like iCF, only with a click on a folder with the right button of the mouse you can reach all the galleries and customize your folders adding color and much more. Horizon My Folder also provides the unique feature of adding folders with dll. exe. and icl. extensions to the library.